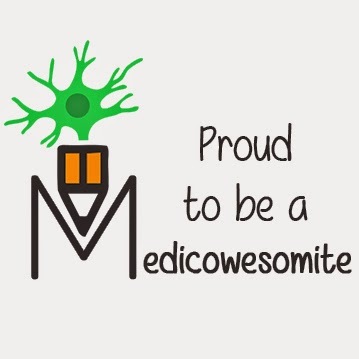 Medicowesome: Ketamine- A new antidepressant! Remember those conventional classes of drugs used for treating major depressive disorders?? Well, now I have a better one. Ketamine! So, tell me... how long do conventional anti depressants take to act and reverse the symptoms in the patient?? Of course it may go on to weeks, months, or even years in drug-resistant cases. While these drugs require chronic administration to improve patient's performance, ketamine effects are rapid and long-lasting. In depression, there is an altered connectivity in brain areas that sub-serve cognitive functions, such as Pre-frontal cortex (PFC) and Hippocampus (HC). The size of pyramidal neurons in these areas decreases. Also there is neuronal atrophy. Brain Derived Neurotrophic Factor (BDNF) normally plays a key role in synaptic growth and consolidation. 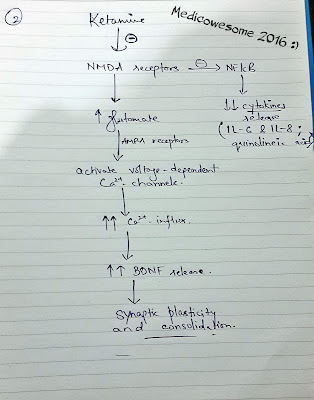 In depressed patients, Stress-induced hyperactivation of Hypothalamic-pituitary axis and loss of glucocorticoid feedback lead to dysregulation of BDNF signalling!!! 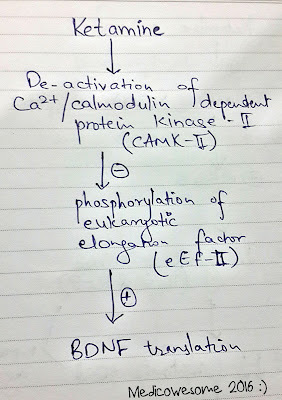 Ketamine induces deactivation of Calcium/calmodulin- dependent protein kinase II (CAMK II), which then blocks phosphorylation of eukaryotic elongation factor II (eEF II). 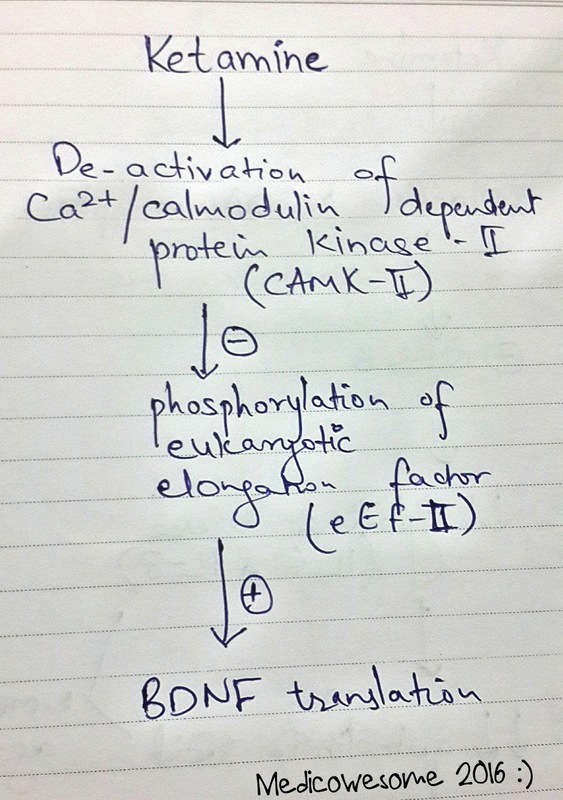 This initiates BDNF translation and thus increases the protein expression. 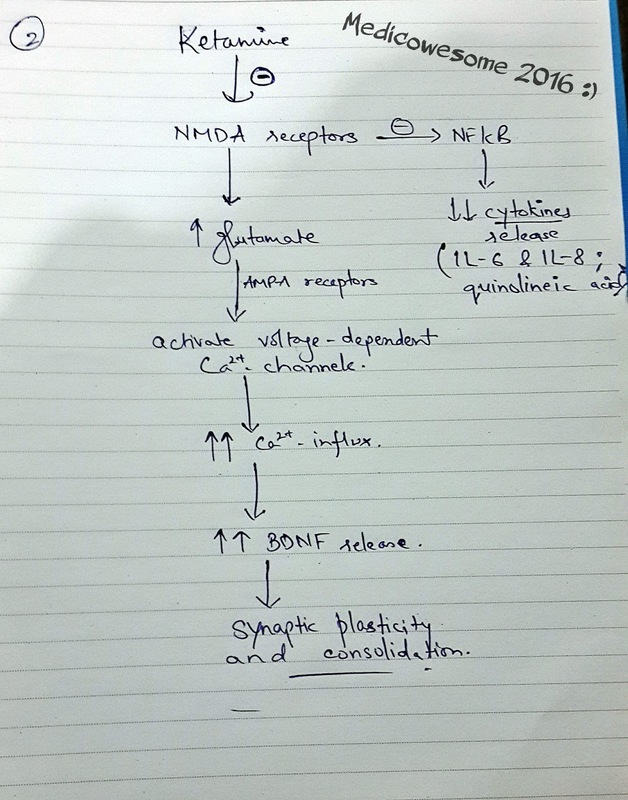 Note here I have mentioned that ketamine blocks NMDA receptors which inhibits Nuclear Factor- kappa B production. NF-kB controls cytokines release. So less of it leads to failure of NMDA agonism by the interleukins and tryptophans. By blocking these receptors, ketamine prompts the brain to increase the production of synaptic signalling proteins in the prefrontal cortex. So not only it promotes the growth of new synapses, but also switching certain connections on and off. Given to the patients, signs and symptoms improve very rapidly.. results seen as quickly as 2 hours of taking the drug. It is especially to be prescribed to TREATMENT-RESISTANT DEPRESSION patients (failure of at least two anti depressant treatments from two different classes). But take caution with ketamine due to high chances of drug abuse and other neurological side effects!